It is the second most important shot in tennis. 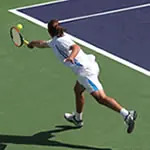 Given how difficult it is to have a dominant serve, one could almost argue that if you do have merely a good serve, you'll lose far more often if additionally you have a poor return game than if you have a poor serve but a good return. History is replete with great servers causing memorable upsets, but still are relatively few when that is the only skill they excel at. On the other hand, while great returners do not have such memorable upsets on just their return game, they seem to win a lot. An example to illustrate this might be in order. In the modern game, you'll hear about the exploits of Isner, Karlovic and these days, Raonic. Great servers, all of them, yet when it comes to accomplishments, the diminutive Ferrer has definitely enjoyed greater success. He has won more titles, been ranked higher and has done this without a big serve. I will hasten to note that an example is not evidence of a pattern, it is only illustrative of the phenomenon. So what does it mean to be a great returner, or perhaps the greatest returner in the game? Today, that sobriquet seems to be bestowed upon Novak Djokovic, the reigning #1 player and the cream of the crop of the decade. Before I look at the question, allow me to state two other "greatest returners" that I witnessed in my lifetime: Jimmy Connors and Andre Agassi. disgrace on the courts with his verbal diarrhea. But boy could he return! There was no server that he could not neutralize, and no serve that he did not threaten to put back in play. His lunging two-handed backhands to not just get to the serve but to place it deep with some heat on it is imprinted on my memory. Granted, we did not track statistics such as percentage of return games won, or points won, but it was undeniable. Many a big servers saw their best serves come back over the net whereas against lesser mortals, the server was probably looking for balls to serve. I have memories of big servers like Chip Hooper (quiz: who was he? ), Kevin Curren, and Ivan Lendl being cut down to size where the serve was effectively not a weapon they could employ. He routinely made it to the latter rounds at Wimbledon which during his heydey (and till the dawn on the new century) was the fastest surface, most conducive to big servers. He thrived in an era of big servers with his return. Yes, his record faltered with age, but he could always return, and put back seeming aces into play. had played against both anointed him the best ever. While I do not weigh a player's opinion any more heavily when it comes what can be observed, one has to consider that this was the opinion of someone who had faced both of them, and therefore had firsthand experience. Part of Agassi's aura was built around his ability to take the ball on his rise, but his match-play against the big servers of his day points to more than that. He was 14-20 against Sampras (and the player with the most success against him), 10-4 against Becker, 6-0 against Stich, 4-3 against Ivanisevic... justified that status. After all, servers were bigger and better with the modern racquets and training, and Agassi took it to each of them. 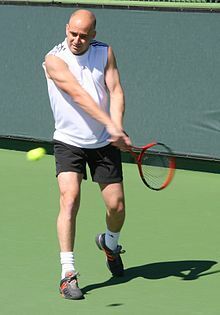 He was not a great mover, did not have a big serve, his groundstrokes were great, but nothing exceptional. It was his return of serve, so one has to consider that, yes, his return was really exceptional. That brings us to Djokovic, the current holder of the "best returner ever" title. Anyone who follows statistics knows that he consistently ranks in the top 2, usually in the top spot when it comes to games broken, percentage of return games won, etc. Even without the objective evidence, those watching him will attest to the number of balls he gets back into play. Make no mistake, he is a phenomenal returner, and while I would not argue too much with those who want to consider him as the best ever, I'll ask them to consider an anomaly. His performance against big servers. To that end, I would name Roddick, Karlovic, Isner and Raonic as the big servers of his era. 4-5 against Roddick, 1-2 against Karlovic, 5-2 against Isner, and 4-0 against Raonic. Federer, himself a great server, too has a positive record against Djokovic, but we can set that aside because he brings other weapons to the game. At any rate, the preceding is not exactly a stellar record for the best returner ever. As a comparison, check how Federer, not known for his return of serve, fares against these same opponents. So whither from comes the justification? Perhaps what is overlooked is the rest of his skills. He is a tremendously gifted athlete, easily the most flexible on the tour, and quite possibly the fastest as well. He is a great returner, so while he may not make devastating returns every time, he puts the ball into play, and within a couple of strokes is back to neutral in the point. So it is no surprise that he does end up atop the leader board on return games won, but I suspect that it is deceptively skewed towards his return of serve. As an exercise, compare his return of serve stats to that of David Ferrer, and then ponder why Ferrer should not, by the same token be judged as the second greatest returner in the game. It'd be nice if some stats junkie could try and reduce this to an analysis based on numbers.